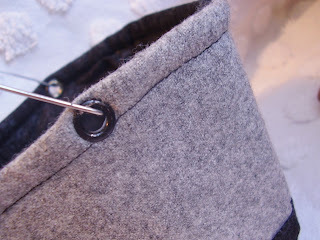 For ages I have been keeping a few little wire noodle-box handles with the aim of creating a fabric box for them. This was easy easy. I had a cardboard noodle box here so I just chopped it up to become the pattern. I used some hammer- in eyelets on the sides for the handles. It kinda falls into the cute but useless category- or at least I haven't thought of a use for it yet. 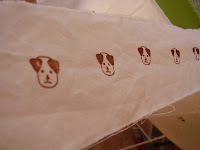 To give it structure I used wadding (batting) as well as a firm iron-on interfacing. I carefully ironed the interfacing to the batting rather than the fabric (less wrinkles that way). 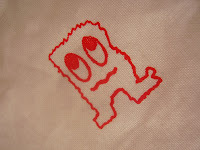 I have also been spending a little quality time with Mr Gocco and made some teeny tiny designs on fabric. It is still a bit of a hit-and-miss affair but I think I am slowly getting the hang of it. I have also started my first ever real sized quilt. How do you people make quilts.... it takes for bloody ever!!! I might still be doing this one when I am ninety !!! I didn't want to do anything complicated so just decided to wing it and make it up as I went along. (what was I thinking) . If today was anything to go by it is a good thing I have the men-in-white-coats on speed-dial. Wow you've been busy!! I love your 'useless' basket - it actually looks very useful to me! Your gocco prints are gorgeous and it looks like great fun. As for the quilting - I did a tiny bit the other day and have decided I may not have the stamina or willpower to make a full sized proper quilt - good luck with that one!! Oh Jodie, HIYA! I'm on a very slow old dinosaur here but leaving a quick message (that is taking forever)- very excited about your lime quilt and will look forward to inspecting progress on my return. I have been doing some handquilting of my report writing quilt - VERY hot here 37 today! 42 tomorrow ... yuck! There are many crafts that seduce and that I give some sort of go - but quilting? I just know that ain't for me. I would love buying the materials and then that would be that! Are you going to be doing the quilt by hand? If so, then I agree it will take you until you're 90. If it is all machine done, it might be a little quicker. I actually like making a quilt when it takes a bit longer - it's like they become part of my life for a short time, and then I have to give them away. I love your little noodle box, too. Lovely goodies there Mrs Ric-Rac - but I want to see more of the Little People please!!! What a cool basket! You rock! I am really impressed by how much you are doing and the range you have of skills and abilities. 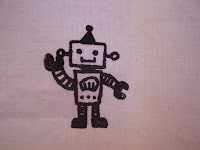 Your robot and creatures are adorable! I want to see the quilt you are making!!! The baskets are great, three together would be zen like. Storage is good. I've been wanting to make a fabric noodle box for YEARS, and still haven't gotten around to it...I think they are SO cute! Nice gocco work, too...I am tossing up whether I want one or not. My MIL, also super crafty/creative, is convincing me I don't, but then I keep seeing stuff like this, and thinking I really do. Love all of your projects! Great blog! I look forward to coming back for more! PS. Can I get the details of the book you made the little dresses from? well, I thought I'd wing it on a couple quilts too. When I finally followed directions for a quilt, it was so easy and went together so quickly that I really think it worthwhile to use directions once in awhile...although I rarely do. Oh wow. 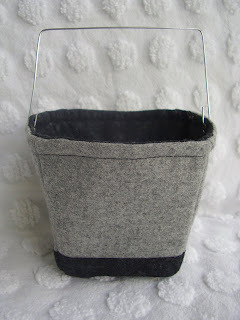 Love your basket and no it is not useless at all! It would a great gift basket. Fill with fancy chopsticks, Chinese Restautant Gift Card, homemade or store bought fortune cookies OR chopsticks, recipe cards, good soysauce, rice, etc... Oh that basket is just great! Thanks for putting a smile on my face while reading this post. I certainly know where your coming from about the quilting. I am about to start one too but hate the idea of leaving my machine up all the time. Thanks for commenting about the poor boy drowning on my blog. I did an interview with our local paper today to try and get the council to add signage and fences. dont be a woosy girl and get into that quilt.. once you finish one, you'll be addicted.. you'll wonder 'will the cat like a quilt?' does the dog need a new quilt? I am telling you, quilting is addictive! I love your gocco work too, I am a sooky lala about the gocco, I've had mine, what a week longer than you and told you what a gocco does etc you get one and actually use it? I am impressed! I love that noodle box and I could think of lots of things to put in it. What a wonderful idea. Love the basket...we could think of some fabulous uses for such a sweet thing! As for quilting...very admirable- we appreciate it... especially when others do it!!!! Those gocco designs are fabulous!